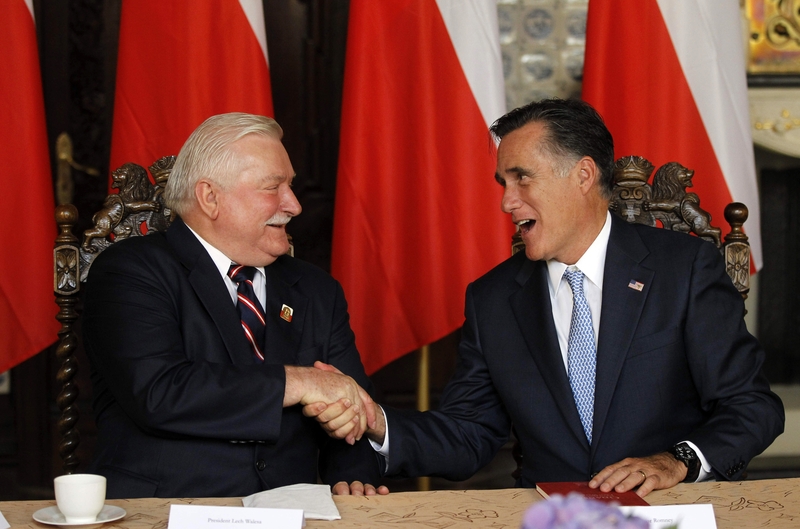 (CBS News) GDANSK, Poland -- Lech Walesa, the Nobel Prize winner and former Polish president, on Monday expressed hopes that Mitt Romney would win the presidential contest during a meeting between the two men on Romney's first overseas trip as the likely Republican nominee. In response, Romney said, "Thank you so much. I appreciate your invitation and I'm glad to be here with you. ... You play such an important role on the world stage. You travel throughout the world, including Tunisia, and other parts of the world to describe the values of freedom which you champion here." Romney's half-hour meeting with the former Solidarity union leader, whose democracy movement in the 1980s is credited with helping end the Cold War, came on the last leg of Romney's trip, which included stops in England and Israel. Romney also had a meeting with Polish Prime Minister Donald Tusk on Monday.